In the first six chapters, Paul has dealt with sins that were reported to be commonly known in the Church at Corinth. He now turns to the specific question they had asked of which this letter was a response. The subject of chapter seven is marriage. Raymond Woodward points out that we should keep in mind that Paul is addressing specific questions and not expounding a complete doctrine of marriage. It is important that we consider what all of Scripture says on the topic. We also find very interesting language in this chapter not found anywhere else in the New Testament. For example, Paul says, “But to the rest speak I, not the Lord” (7:12); and “Now concerning virgins I have no commandment of the Lord: yet I give my judgment” (7:25). Paul was dealing with issues which Jesus had not addressed. He was giving his judgement on the matter as he was directed by the Spirit and considered the entirety of the Scriptures. We also must answer new and difficult questions regarding sexuality as we are led by the Spirit and guided by the Word. At first glance, you would think Paul is elevating singleness and undervaluing marriage. He is doing no such thing. He says that it is good for a man not to be married, but he does not say it is better. In other words, it is not sinful for a person to remain single if they keep themselves pure. “But if they cannot contain, let them marry: for it is better to marry than to burn” (7:9). 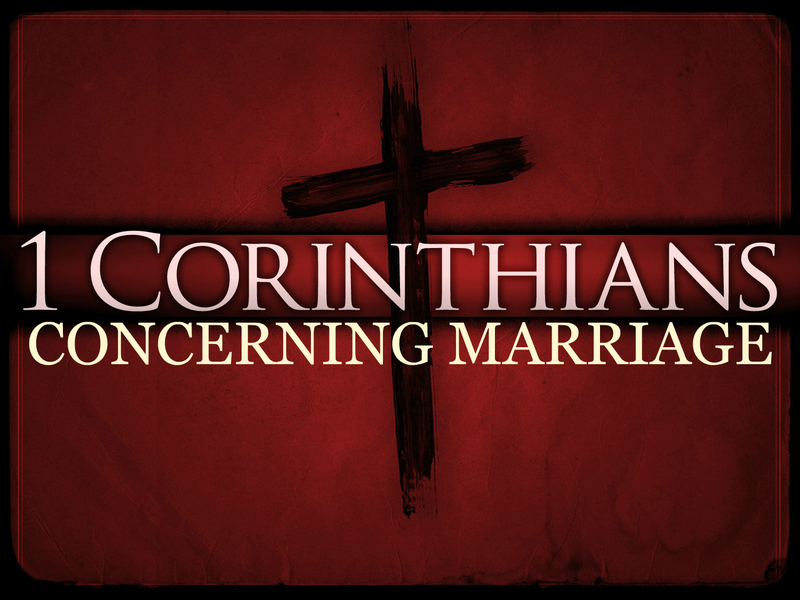 Concerning marriage itself, Paul insists on a monogamous marriage between a man and a woman (7:2). Both the husband and wife have responsibilities and rights which must be respected. Marriage is not an excuse for lust and the satisfying of the flesh. It should be marked by love, discipline, and mutual respect. Paul also has something to say concerning divorce. If two Christians are married, there is to be no separation. Jesus made only one exception for this (Matthew 5:32) – if one spouse is guilty of adultery, this could be grounds for divorce. Paul speaks of the power of the marriage relationship for those who have been saved after they were married. He encourages them to remain with their unsaved spouse in order to influence them that they might be saved. As a child of God, the saved spouse is God’s vantage point to reach the unsaved spouse. If your spouse is unsaved, begin to claim their salvation in Jesus’ name! “Let every man abide in the same calling wherein he was called” (7:20). “Let every man, wherein he is called, therein abide with God” (7:24). If God has called you to be single, He will give you grace for it. If He has called you to be married, He will give you grace for it. If He called you to marriage and that marriage has led to adversity, He will give you grace for it. If you are recently saved but your loved one is not, He will give you grace for it.